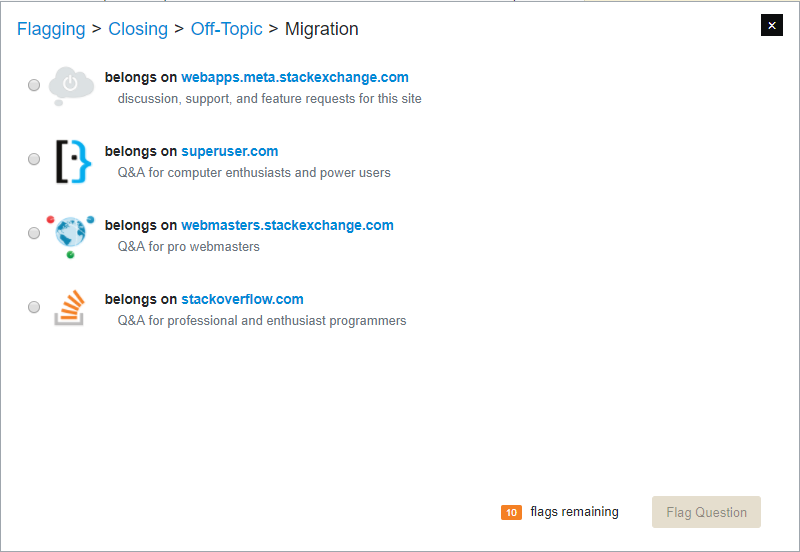 I came across this question, and wanted to flag it for migration. From the question content, it seems that the appropriate site would be Interpersonal Skills, but it's not on the listed on the migration sites. What should I do about it, and what is the correct way of handling those kind of questions? When you flag select the "in need of moderator attention" (or "other") option on the first dialog and explain where you'd like the post to be migrated to. However, please bear in mind two things. We don't migrate crap. So if the question is not a good question don't flag it for migration. Just vote/flag for it to be closed and perhaps leave a comment pointing them at the other site. If you do leave a comment please remind them we want quality questions. Is it actually on topic for the other site? Just because a question is off topic here doesn't automatically make it on topic on another site in the network. We don't have sites that cover everything. Even if the question looks like it might be on topic, check the other site's posting guidelines to make sure. How do I associate my Web Apps account with my SOFU accounts? Can we black list [web-application]? Should questions that straddle web/desktop applications be migrated to SU? I made a terrible mistake with flagging for moderator attention! How can I reverse it?